A long par 4 where the fairway slopes left to right. Your drive should be down the left half of the fairway where it will finish on a flat area and avoid the strategically placed bunkers. Your shot into the green needs to carry all the way as the green is elevated, has a slope at the front and is well guarded. A tough hole. 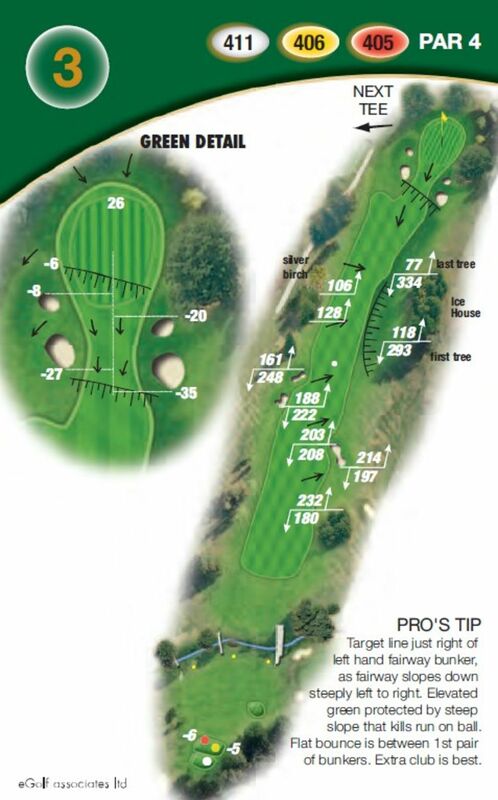 Your target line is just right of the left hand bunkers as the fairway slopes steeply. A elevated green protected by a steep slope that kills run on the ball. A flat bounce is between the 1st pair of bunkers. Take an extra club for your approach shot.